This recipe for Chocolate Mint Chocolate Chip Cupcakes is the only chocolate cupcake recipe you’ll ever need! 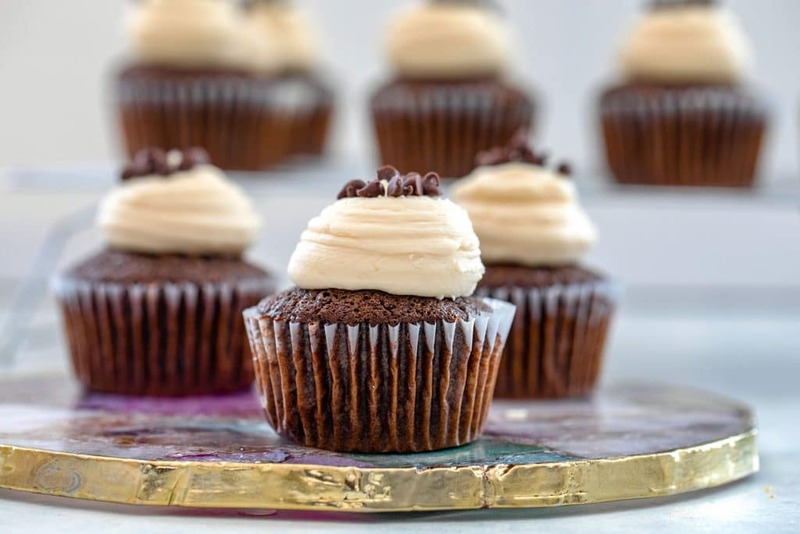 They’re chocolatey and moist and even better when topped with Baileys frosting. 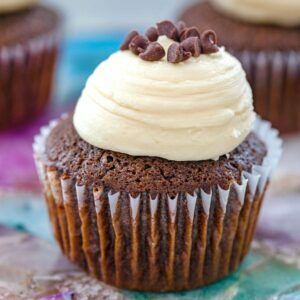 (This recipe for Chocolate Mint Chocolate Chip Cupcakes was originally posted in January 2009, but has been updated with new photos and content in 2019). Over the past year, I’ve gone back and updated many recipe posts on We are not Martha. 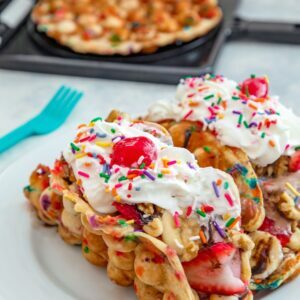 Oftentimes, I make adjustments to the recipes because in the 11+ years I’ve had this blog, I’ve come a long way in my cooking and baking skills (at least I like to think so!) and many of my old recipes could use some tweaks and improvements. This is one of those recipes that, as I was re-making it according to how I originally made it in 2009, I thought, “yikes, this doesn’t sound like it’s going to work.” I had absolutely no memory of how they came out 10 years ago and though I wrote in my blog post that they were delicious, my shoddy photos gave zero clues. 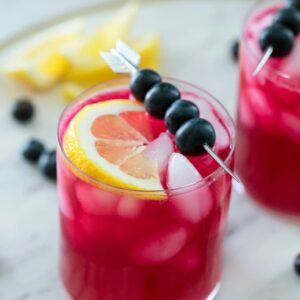 I almost started switching up ingredient ratios, but then I read the comments on the post and saw that a few people had raved over the recipe. So, I kept trudging on and low and behold, they were some of the best cupcakes I’ve ever made. I guess my 2009 self kinda knew what I was doing when it came to baking cupcakes! And now I feel a little bit of sadness that I went an entire TEN years between making these chocolate mint chocolate chip cupcakes. I promise I will never ever let that happen again. I love all things mint chocolate… especially when there are also chocolate chips involved. And extra chocolate! Sometimes I like my mint chocolate chip flavored desserts to be green (ice cream! ), but sometimes it’s just not necessary. Especially when we’re working with chocolate as the prominent flavor. These aren’t just mint chocolate chip cupcakes; they’re CHOCOLATE mint chocolate chip cupcakes. In case you’re wondering why I was nervous about this recipe, I initially thought the cupcakes were going to be too buttery and didn’t have enough dry ingredients in them, but that just made them extra fudgy and indulgent! Start by creaming the butter and sugar together until it’s light and fluffy. You can either use a stand mixer or a large mixing bowl with a hand mixer or whisk/spatula. Add the eggs in one at a time while continuing to mix. Then add the vanilla extract and peppermint extract. I used 3/4 teaspoon of peppermint extract and felt that it was the perfect amount. However, I like a subtle mint flavor and nothing overpowering, so feel free to use a bit more if you want to pack more of a punch. In a separate medium bowl, whisk together the flour, cocoa powder, baking soda, and salt. Add the flour mixture to the liquid mixture a little at a time, alternating with the milk. Then stir in the chocolate chips. Don’t you just want to eat that batter with a spoon?? Pour the batter into your cupcake pan fitted with papers. Fill them a little more than 3/4 of the way. Bake cupcakes at 350 degrees for about 18-20 minutes. I was super excited that my cupcakes came out to the perfect height! I know, it doesn’t take much to make me happy, but I hate when the cupcake is at the paper level and it’s not good if they’re spilling over either. These are perfect. Now you can make the frosting! Of course, you can make any kind of frosting you want with these cupcakes. At first I thought the Bailey’s might be taking the cupcake a bit too far. I mean, mint, chocolate, and Bailey’s…that’s a lot of flavors. But then I realized there’s always room for Bailey’s, so I just did it anyway. And everyone who tried the cupcakes said it worked and was delicious. I also feel like people are only publishing Baileys recipes during St. Patrick’s Day, but it really is an “any time” liquor and should be enjoyed throughout the year! 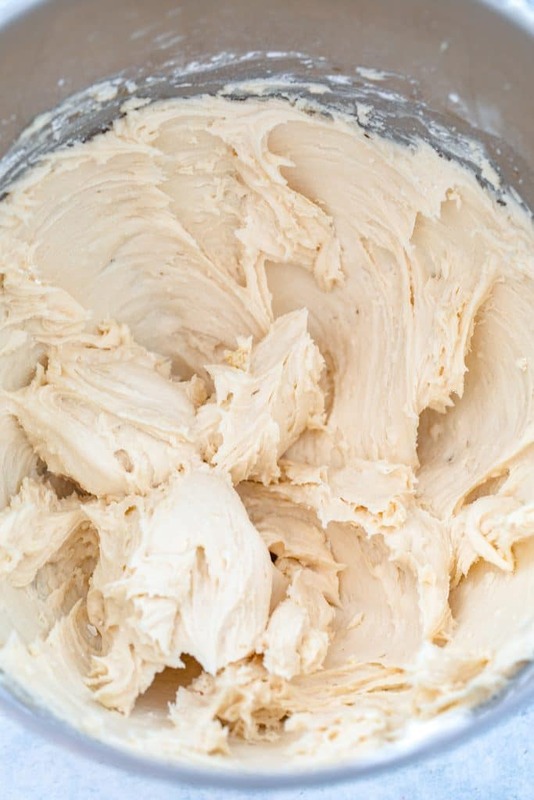 In the bowl of a mixer or in a large bowl with a hand mixer, mix butter on medium speed until it’s nice and fluffy. Add confectioners’ sugar one cup at a time and beat until well-combined. Mix in salt. Add the Baileys and beat until combined. If frosting is too thin, add more confectioners’ sugar a couple tablespoons at a time. Now, frost your cupcakes! You can frost them any way you choose, but I’ve been loving just squeezing on a mound of frosting with my Wilton 1A tip. You may have some frosting left over depending on how you frost the cupcakes, but you can store it in an airtight container in the fridge and use it for something else later… Liiike eating with a spoon for a midnight snack. I topped the frosting with mini chocolate chips. You can certainly use regular size chips or use sprinkles or something else instead. 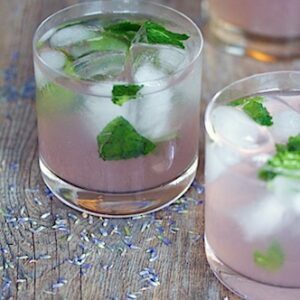 Even a little sprig of mint would be cute! You really don’t have to top them with anything at all because these chocolate mint chocolate chip cupcakes are just so freaking good as it. They’re one of the most moist and delicate chocolate cupcakes I’ve ever had and I will never ever let 10 years go by before I make them again. In fact, I don’t even want to let 10 minutes go by! And please do not wait for St. Patrick’s Day to enjoy Baileys buttercream frosting. I mean, there are definitely times when it may not be appropriate… Say, at a child’s birthday party. But other times it is totally necessary and appropriate; say, every other day of the week. And chocolate mint chocolate chip cupcakes? They are absolutely perfect at any time. I’ve been on a major cupcake making streak lately and it’s reminding me of the early days of having this blog when I was absolutely obsessed. Of course, back in 2008, cupcakes were the major food trend. Though their trendy popularity has faded quite a bit, they’ll always be a classic dessert go-to and you’d be wise to have a fabulous recipe or two up your sleeve. 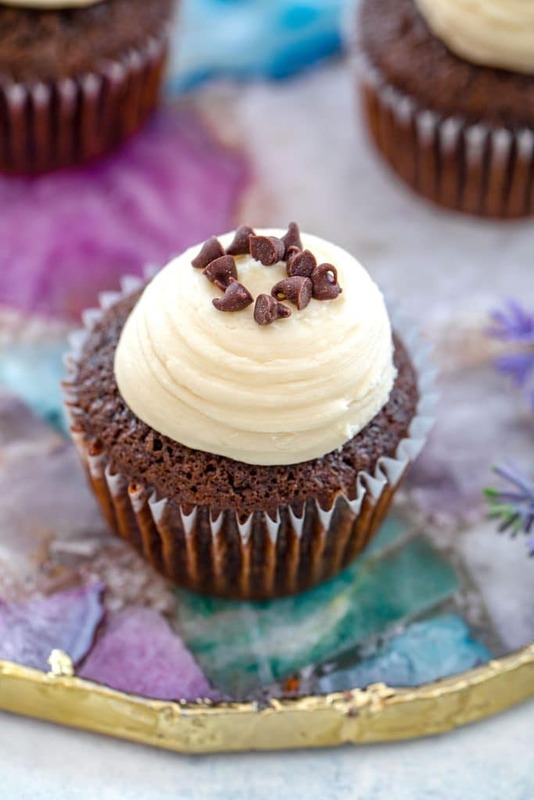 This chocolate mint chocolate chip cupcake recipe is one of them (and simply omit the mint extract and you have a simple chocolate cupcake recipe!). What’s your favorite flavor cupcake? I’m also in love with these Rainbow Cupcakes from Aimee Geroux! This recipe for Chocolate Mint Chocolate Chip Cupcakes is the only chocolate cupcake recipe you'll ever need! They're chocolatey and moist and even better when topped with Baileys frosting. Pre-heat oven to 350 degrees and line a cupcake tin with 12 papers. In the bowl of a stand mixer or in a large bowl with a hand mixer, cream together butter and sugar on medium-high speed until light and fluffy, about 3 minutes. Add eggs in one at a time, mixing well after each addition. Mix in vanilla and peppermint extracts. 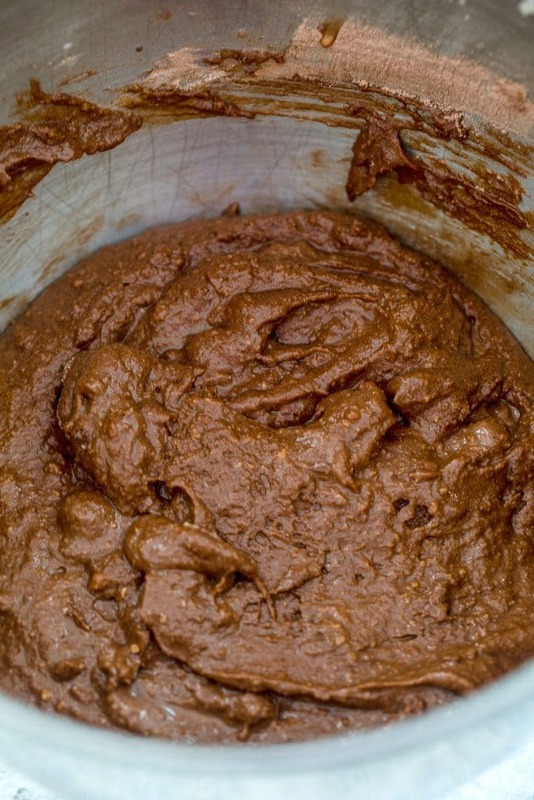 In a separate medium bowl, whisk together flour, cocoa powder, baking soda, and salt. With mixer on low speed, mix in dry ingredients in 2 additions, alternating with milk. Mix in each addition until just incorporated. Gently fold in chocolate chips. Fill cupcake liners about 3/4 of the way with batter. 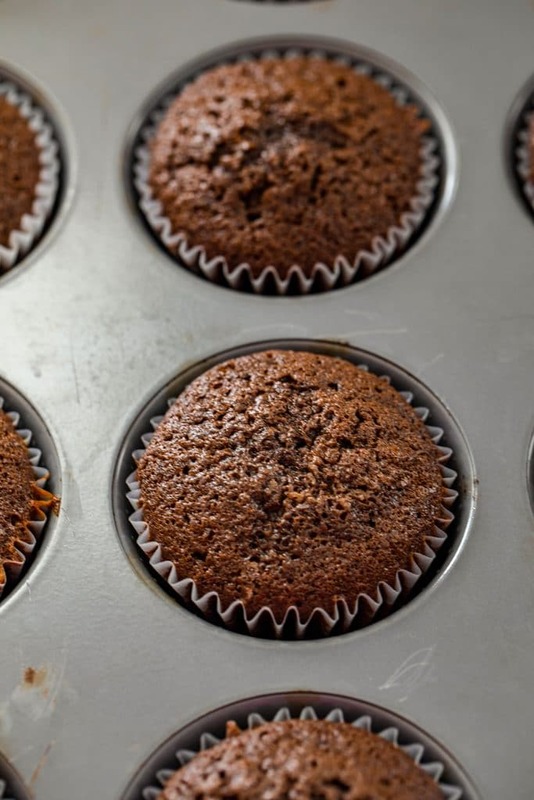 Bake cupcakes for 18-20 minutes, until toothpick inserted into center comes out clean. Let cupcakes cool in tin for 5 minutes before moving to wire racks to cool completely. In the bowl of a mixer or in a large bowl with a hand mixer, mix butter on medium speed until it’s nice and fluffy. Add confectioners’ sugar one cup at a time and beat until well-combined. Mix in salt. 15 Responses to "Chocolate Mint Chocolate Chip Cupcakes"
What a fabulous cupcake variety!! mmmm. baileys frosting?!?! music to my ears!! these were the BEST cupcakes you have ever made. omg, unbelievable! 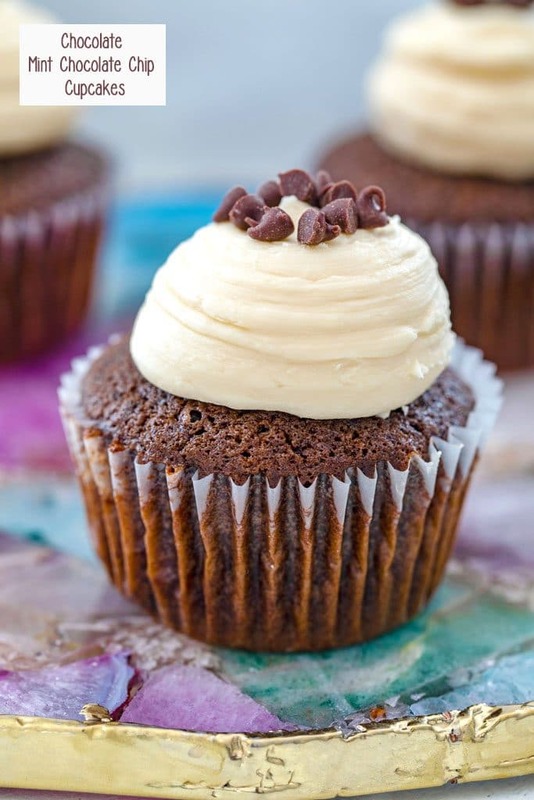 Mint chocolate cupcakes with baileys sound great! I want to put my hand through my laptop’s screen and take two of those cupcakes. And eat them both right now. They look absolutely delicious. This is one of the best cupcake recipes I’ve tried. The batter itself was tempting enough to not make the whole batch. Thank goodness my daughter helped me and would have noticed the lack of cupcakes. I just googled mint chocolate chip cupcake recipes and found this blog…so glad I did. I just made these cuppy’s and my family loved them. Especially my husband!! I was lucky enough to find dark chocolate/mint chips on clearance at Target. They are made by Nestle Toll house I guess they are limited edition during the holidays. I added 1/2 cup of chips to the batter and added 1/4 cup of melted chips to the frosting. Like I said my family loved it!!! Thanks for this recipe!! 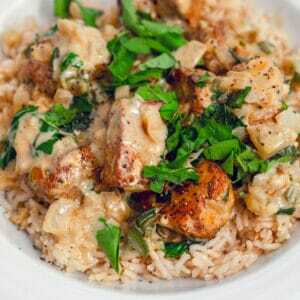 I stumbled across your website a few days ago and this was the first recipe that I tried. This is a terrific recipe and the cupcakes were a HUGE hit (though I used vanilla frosting instead of the Bailey’s since I was bringing some into the office.) I can’t wait to try more of your recipes!! What a delicious flavor combo! I love that you wouldn’t know they are mint until you bite into them as you’ve kept the frosting naturally coloured rather than green and the fact that it is Bailey’s frosting, well, I was always going to love these cakes.